The story of FreeWaters sandals and footwear starts with a friendship formed in 1997 between Martin Kim and Eli Marmar at the Art Center College of Design in California. After ten years of designing snowboard boots and wetsuits, both Eli and Martin set up shop in San Francisco to create a line of footwear that embodies the California style free spirit and positive vibes. With such design inspirations becoming reality at the solar powered 'Shaolin Temple,' nestled in the redwoods - the FreeWaters design studio is where designers Martin and Eli take their inspirations and overcome the other loveless shoe sellers out there trying to sell outdated styles with cheap construction and toxic materials like PVC. At FreeWaters, with every product sold, clean drinking water projects are funded and undertaken by providing the tools for building water wells around the world - Taking brand ambassadors from Kenya to the Cayman Islands and South Africa in providing clean drinking water for local populations. More still, FreeWaters incorporates ecologically sound business practices in the construction of their own footwear. With ninja like strategic environmental standards, FreeWaters mission is to simply do good and provide you with a proper pair of footwear that gives those hardworking feet of yours the vacation they deserve. 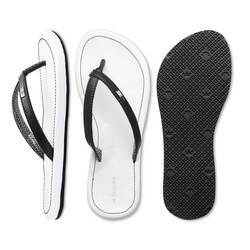 With FreeWaters, both Men's and Women's shoes, sandals and flip flops are offered. The FreeWaters Porter sandals for Men boasts an arch support midsole constructed with Recycled Cork assembled with water based glue for an all around environmentally conscious design. More so, with a hydro leather strap and vegan soft webbing at the toe strap, the FreeWaters Porter sandals give you comfort in both the mind, body and sole. 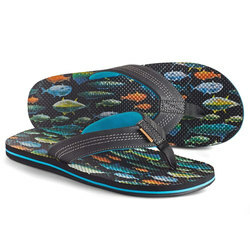 Additionally, the FreeWaters Magic Carpet sandals provide a unique design aimed at providing the best kind of comfort. With a 3-D Molded Traction footbed that massages and circulates cool air on the foot while flushing moisture out - The FreeWaters Magic Carpet sandals give you a brand new world of comfort and performance. More still, the Women's FreeWaters Vezpa Sandals gives you that careless summertime bliss with EcoSmart neoprene lining on the strap made from recycled PET plastic bottles as well as a Vegan leather wrapped midsole for a clean and water friendly design accented with a floral stitch detail. Beyond FreeWaters' Flip Flops, you'll find a variety of stylishly designed shoes like that of the Women's Travel Bug shoe. Made with a breathable canvas and set up with the Super Pillow Insole, the FreeWater's Travel Bug gives you lightweight and effortless comfort enhanced by the 4-way flex grooves and a no-slip sponge rubber outsole. By providing every customer with a piece of footwear unparalleled in design, comfort and environmentally conscious production - FreeWaters maintains the worthy goal of giving back to the world. And with every product you purchase from FreeWaters, be it the Sandals, flip flops, or shoes - You get an extra pep in your step. Knowing that with your support, some 10,000 villagers have access to clean drinking water that the six water-wells FreeWaters installed. With FreeWaters footwear, you get the opportunity to jump into comfort and style with an environmentally mindful step and extra pep in aiding the people of the world's unalienable right to clean drinking water.